The group concurred and on those principles a STAR, (the Philippine Star) was born. From its conception on July 26, 1986 till today, the Star moved on, slowly gaining in circulation and advertising, always guided by the Biblical exhortation, "Truth Shall Prevail." As the only paper “run by God,” prayer and faith were the foundation of its operations. From No. 23 in circulation and popularity, it is today No 1. "It is the most respected newspaper in the country, respected for its balanced, objective and fair reporting." 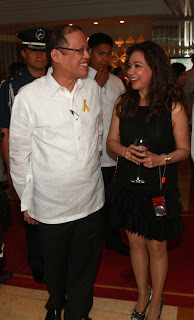 The stars were out on July 28, 2011, as the Philippine Star celebrated its 25th anniversary with the top leaders of the land, President P-Noy and VP Jejomar Binay heading the stellar list of guests. The lights of the Rizal Ballroom of Makati Shangrila were dim compared to the luminosity of the celebrities that attended the event. Manila’s A-List personalities in government, diplomatic corps, business, arts, entertainment and media attended in full force and added to the luster of the occasion. The back to back concert of Gary Valenciano and Martin Nievera (w/ a duet with Sarah Geronimo) was the biggest treat of the evening. On his way out, Sarah S. de Guzman, stopped him and said, “Mr. 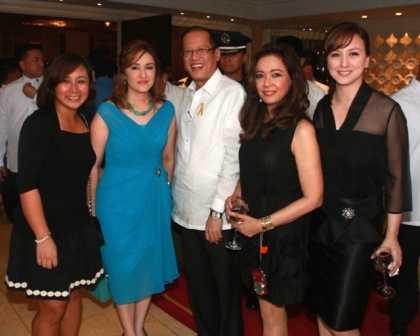 President can you take a picture with us?” President P-Noy smiled and said, “Surely!” Suzette Lopez, (extreme right), myself, Sarah Soliven de Guzman in turquoise, writer for Business page Mary Ann Reyes extreme left. Miguel Belmonte, President and CEO of Philippine Star is the best boss ever! Martin Nievera is another ultimate performer! What a treat!